Questions could be either student generated or asked by the teacher. Consequently, teachers must know how to respond as well as how to ask good questions. Questions could simply be in a question/answer format or with the intent of leading to discussion. Teachers should therefore be familiar with both uses of questions. Helping Kids Learn by Asking Better Questions - This article could help all teachers, not just those who teach kids. Why did Jesus ask so many questions? Questions can be used to get students' attention, guide them in understanding Bible content, and help them think through the implications and application of the lesson. 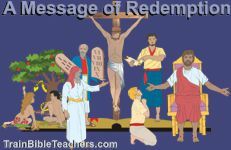 In this three page teacher training worksheet Bible teachers look at types of questions that can be used in the various parts of a lesson and practice developing such questions.